Today's exercising adults are caught in a bind: Those who take it seriously and work out aggressively can end up with chronic aches and injuries because they don't know how to adjust their programs as they get older. And those who take it easy may end up with overfed, underdeveloped, injury-prone bodies. 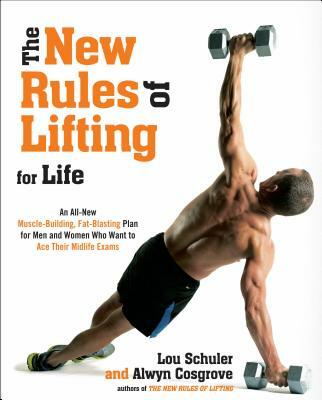 Lou Schuler and Alwyn Cosgrove, fitness experts and authors of The New Rules of Lifting series, know all too well that these readers need a program of their own. That's because they are just like these readers. So they set out to create a new template for exercise, one that delivers real results but is flexible enough to accommodate individual limitations. The New Rules of Lifting for Life offers a six-month plan that integrates total-body strength, endurance, mobility, balance, coordination, and athleticism. The workouts are challenging and, in conjunction with the suggested diet modifications, will help readers change the way their bodies look, feel, and perform. And not just temporarily- The New Rules of Lifting for Life will allow you to enjoy productive and pain-free workouts for many years to come. Lou Schuler is a National Magazine Award–winning journalist, a certified strength and conditioning specialist, and the author of several popular fitness titles. He lives in Allentown, Pennsylvania, with his wife and children. Alwyn Cosgrove is co-owner, with his wife, Rachael, of Results Fitness in Newhall, California.